What is a PEO and why should you outsource your small business HR to one? Although PEOs (Professional Employer Organizations) have been smart HR outsourcing options for decades, we still hear questions like “What is a PEO?” or “How does a PEO work?” or “When would a business need a PEO?” Here are our answers. A PEO (Professional Employer Organization) allows smaller companies to band together as part of a larger employer (Stratus.hr), creating efficiencies for administrative needs that every company needs, such as payroll, workers’ comp policy and claims management, benefits deductions and reconciliations, and more. The PEO also has certified Human Resources experts who are available to clients 24/7 to provide consulting for any kind of HR matter, whether it be hiring or firing concerns, employee disputes, wage and hour issues, employee onboarding, discrimination claims, employee handbooks, and so on. With economies-of-scale working in their benefit, PEO clients are also able to tap into the buying power of a PEO to provide competitive benefits that would be difficult to afford and manage on their own. As a PEO, Stratus.hr becomes the employer of record for your employees while you remain the worksite employer. Many people refer to this as co-employment. Your employees still work for you and you manage them as always, but Stratus.hr assumes the responsibility and liability of wage payments and other HR compliance laws. Your company gets the protection and service it needs and you’re free to get back to building your business. When does a business need a PEO? Typically when companies grow, they experience the need of having somebody take care of their human resources needs. But finding an employee who specializes in every aspect of HR is difficult and costly to hire. With Stratus.hr, you get the equivalent of a five-person HR department, with certified experts in each aspect of human resources (payroll, benefits administration, employment law, worker’s comp and risk management), as well as access to more robust and affordable benefits for your employees. The best news is that most companies who use a PEO save money by tapping into their economies of scale. In a nutshell, a PEO simplifies the administrative headache of having employees and makes you a more attractive employer along the way. Still have questions? 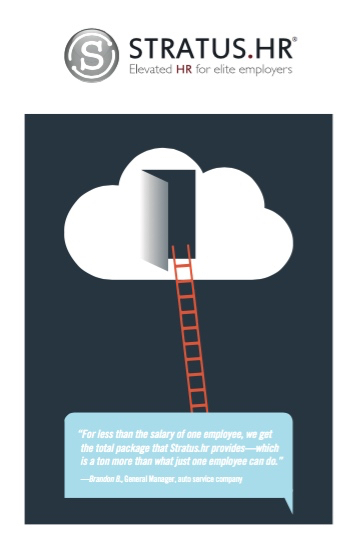 Contact us or learn more about Stratus.hr’s services here. Are 50% more likely to stay in business. Is outsourcing right for your business? Find out today! Let Stratus.hr give you a free quote customized to your specific needs.